Lebanon dumps armoured vehicles into the Mediterranean in a bid to boost marine life. Are you kidding me? It`s one of the AMX 13 series. I`d say 13 75. With that barrel and muzzle brake, it’s a 90mm gun. Yeah it’s definitely an AMX 13 of some sort. 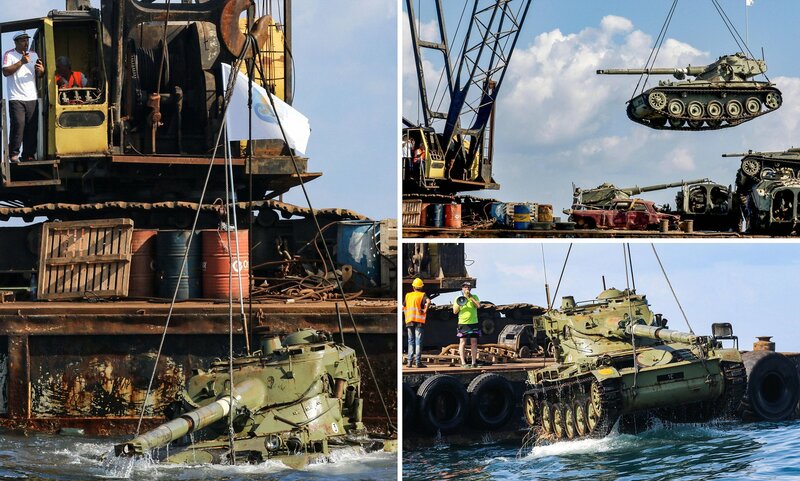 Yea dump an multi million worth tank into the water instread of some steel from the scrapyard. Why would they do this to musem worthy tanks? Bloody hell. Considering most museums had to fix it up beforehand. Not every museum can afford to take everything. I’m sure you recall the last BC 25t. It was a wreck behind a museum for decades until they finally could afford to paint it and move it up. Multi million? If most of the tank is beyond repair they would be lucky to get 10 000 for it. As a working AMX 13 goes for about £30 to 40 000 now. As I’m willing to bet most of these have not seen any action for ages. As not all tanks get the same maintenance or care. As like most nations, after a bit you start to take parts from other tanks to keep the rest going. If this is a skeleton tank. I see why not. Oh, my bad, looks like a pprt 🙂 Down with it! I feel bad for the poor tank(AMX 13 90 maybe? ), cause it’s such a nice looking little light tank. stupid lebanon, what a waste of a tank! Would the historical significance that its crew was good enough to have been 2-Marked add anything to its value? Calm down you kids. It’s just an AMX 13 not a Leopard 2. Some countries scuttle entire warships in working condition in order to do the same. Don’t worry about steel, we have plenty, and i assure you the the steel that they would get from chopping this thing to pieces and melting it down, simply wouldn’t even cover the cost of doing it….